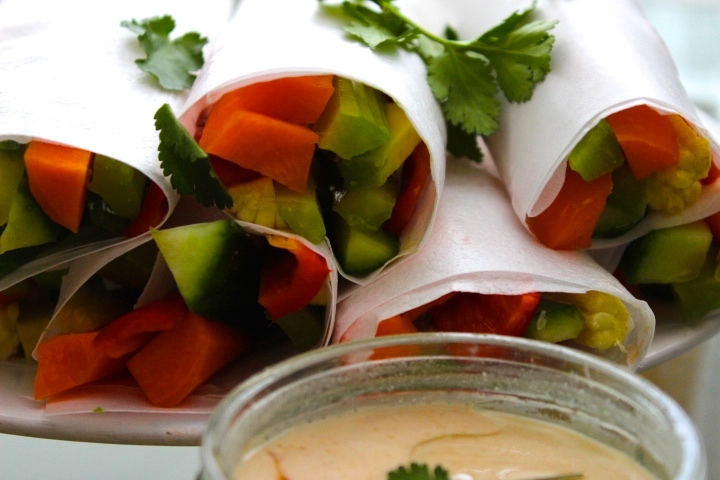 These spring rolls make a healthy, delicious, snack, or appetizer that you can personalize with your choice of seasonal vegetables. Additionally they only take 5 minutes to make and are packed with fresh vitamins & minerals. 1.Place the rice paper into a bowl of warm water for a few seconds, remove & allow to soften. 2. Place in the middle of the rice paper a few strips of your chosen vegetables. Carefully fold the bottom & top together over then the right side & then roll. 3. Continue this process with the rest of the spring rolls. Place all the dip ingredients in a bowl & stir until you have a smooth consistency. If you love Asian spring or summer rolls, you’re probably familiar with the delicate, starchy taste of rice paper, a thin wrapper that’s relatively low in calories. However, you might not know that unlike wonton wrappers or other wheat products, you do not have to cook rice paper. For a low-calorie appetizer option, serve your rice paper-wrapped rolls fresh instead of frying them. They save you time & are fresh & simple to prepare. The number of calories in your rice paper wrappers depends on the variety and brand. One version of Thai rice paper contains about 20 calories per piece, while one major brand of Vietnamese rice paper contains about 34 calories per piece. While all rice paper is made from rice-flour dough, the surface area and thickness are variable. Compare this to a large pita, which has 165 calories per serving, or a single slice of white bread, with 80 calories per serving, and it’s easy to see how using rice paper can help you lose weight. They are equally as satisfying as an Asian spring roll & quicker to prepare while being less heavy on your digestive system. Traditionally, rice paper wrappers are filled with cooked rice or rice noodles, which help to make the meal more substantial. Instead of using rice noodles, which are higher in calories despite being low-fat, consider filling your wrapper with vegetables, such as leaf lettuce and sliced peppers. Theses vegetables provide fiber and nutrients and are equally low in calories. We are adviced to have at least five fruit & vegetables a day. However the perfect number is actually nine serving a day for our best possible health. Do this regularly, and the calorie difference can add up, helping you lose weight. A diet high in fiber can help you lose weight by making you feel fuller with fewer calories consumed & it can also help reduce cholesterol & lower your blood sugar levels. These spring rolls are high in fiber, which helps in reducing high cholesterol. They are a low glycemic index food, which helps reduce insulin resistance. Thus this type of clean food will help protect against cardiovascular disease & is light on your digestive system while being quick & simple to make.